From the Library Tools on the Ribbon, click the Documents tab→New Document and then select OneNote content type. The default OneNote template starts unpacking and you are prompted to enter a name for your new notebook. Your new notebook opens in OneNote 2010 with a new section and a new untitled page under the section. 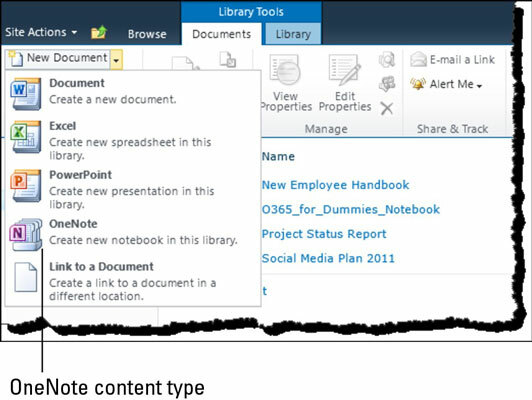 Back at your document library in SharePoint Online, your new notebook is listed as one of the items in the library. When you click on the item, OneNote Web App will display your notebook with the default new section and an untitled page below the section. If OneNote is not one of the content types listed in your document library, you first need to create your notebook in the desktop application and then upload the file into your document library. OneNote Web App opens a notebook in Edit mode by default. You can immediately make changes to your notebook and as you type, your changes are saved automatically. If another user opens the same notebook in either the web app or the desktop application, simultaneous coauthoring automatically begins. Changes made by each of the authors will be synchronized in near real time. To close the notebook, click File from the menu and then select Close. In the Editing View, clicking the View tab presents the user with more options for interacting with the online notebook. Within this tab, you can switch from the Editing View to the Reading View. Clicking the Show Authors icon displays the notes on the current page with a bracket on the right, indicating the author of the content. Clicking the Page Versions icon displays all the page’s versions with a time stamp and the author’s name right below the page name. You can toggle between displaying and hiding the page versions by clicking the Page Versions icon to turn it on or off. In the Reading View, the web app displays four commands on the toolbar: File, Open in OneNote, Edit in Browser, and Show Authors. Because there are no changes to be saved in the Reading View, clicking the File command only brings up two options: Open in OneNote and Close.